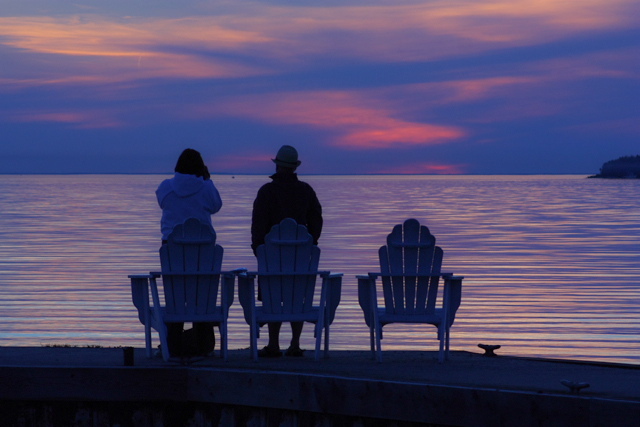 Sharing a sunset in Door County. I setup this shot to include some highlights , I didn't want the couple to be a dark silhouette. overall, i think this is a great idea for the shot. i'm not sure if you meant anything by having the empty chair there, but it almost feels like a "missing man" formation kind of thing. i think the thing that is most hurting this image (compared to the 2nd place winner) is that the sunset/sky is so dark that it doesn't really make the silhouettes pop. at first glance, there's nothing that really grabs your attention and draws you into the photograph. you see it once you look at the image for a while, but there's not much instant impact. it's a good concept and fairly well-done. i just think it's suffering from a lack of "BAM!" Subtle sunset shot. Like the empty chair. Well done. there should be a third person in this shot. Proudly hosted by Sargasso Networks. Current Server Time: 04/20/2019 10:38:19 PM EDT.